The Jets won yesterday, beating the Browns, which, okay. That makes two in a row for New York, which has slightly eased the suffering caused by a particularly disastrous four-game losing streak that triggered the brief return of Geno Smith. Still, you wouldn’t exactly call the victory over the Browns ... encouraging. Ryan Fitzpatrick managed to not throw an interception, but still completed fewer than half of his passes. Matt Forte averaged 3.3 yards per carry over 25 rushes. More concerning was the Jets’ suddenly porous defense, which gave up over 400 yards, and in particular Darrelle Revis, who once again looked like an impostor in his own jersey. These highlights argue that Revis was mostly helpless when tasked with single-covering Pryor, but more depressing for Jets fans should be that Revis seemed to know it, too. On most of these catches, Revis is giving Pryor the sort of cushion you would expect from a green, inexperienced corner who just wanted to keep the game in front of him. 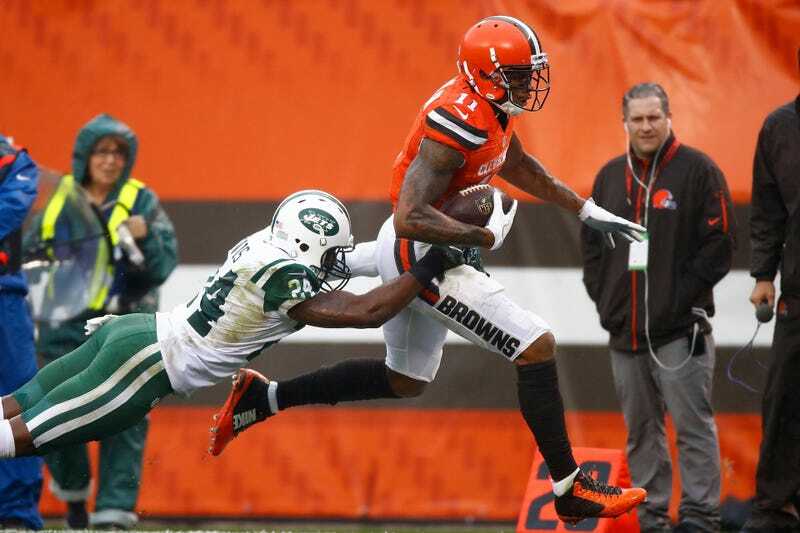 (The Jets reportedly gave Revis safety help in the second half, which he said allowed him to be more aggressive.) Rarely has Revis Island ever looked this expansive, but even then Revis still had trouble getting out of his breaks and making tackles. And on one third-and-short in which Revis played press coverage, Pryor easily got loose at the line of scrimmage and provided an easy window for Josh McCown. One way to interpret this is that Terrelle Pryor is more than just a novelty at receiver, and the precision of the route in the clip above would suggest that he’s on his way to becoming a legitimate go-to option outside. But still—this is a converted quarterback with two career receptions prior to this season, easily working over one of the most fearsome cornerbacks of a generation. It is entirely different than being pantsed by A.J. Green. If the Jets miss the playoffs again, the pressure will be on the relatively new front office to find an immediate solution at quarterback. But eyes will also turn to Revis. Already the New York Post is floating the possibility of the Jets asking Revis to restructure his contract (he is set to make $17 million next season) so they don’t have to cut him. That may seem drastic, but Revis hasn’t played up to that salary this year. The 31-year-old Revis also openly admitted this week that his body is “breaking down,” and it seems like self-preservation is currently at the forefront of his mind. The unending reign of Bill Belichick’s Patriots has a way of conditioning the AFC East’s three other fanbases to not really feel much of anything, but Jets fans did swell with a certain pride when their one-time face of the franchise spurned New England to come back home. But at that point, the twilight of Revis’s career still felt a ways off.